Layering in Miami is very hard...but not impossible. My main recommendation is looking for light pieces and even better if it's sleeveless (meaning that vests are your best friend if you live in a tropical climate). When I got this vest online, I thought it was made ou of faux-leather... and I'm actually glad it wasn't (it's more like "linen" so I can wear year all year round). As you can see, I've worn it with dress pants, jeans, short sleeve tops, sleeveless tops, and dresses (but the possibilities are endless, I want to wear it a lot more on the blog). Have an amazing Wednesday! Tell me.. which look is your favorite? Usar capas en Miami es difícil...pero no imposible. Mi recomendación es buscar telas ligeras y mejor aún si es sin mangas ( es decir, para jugar con capas en climas calurosos lo mejor son los chalecos). Cuando compré este chaleco por internet, pensé que era de cuero- pero ahora me alegro que haya sido de hilo porque puedo usarla mucho más. Como pueden ver en las fotos, este chaleco blanco lo he utilizado con pantalones de vestir y con jeans....con camisas sin mangas y con mangas... y con vestidos. Pero las posibilidades son infinitas... estoy segura que lo verán más seguido porque me gusta mucho. oooh my favorite is 2! Muy versátil me gusta la primera propuesta. 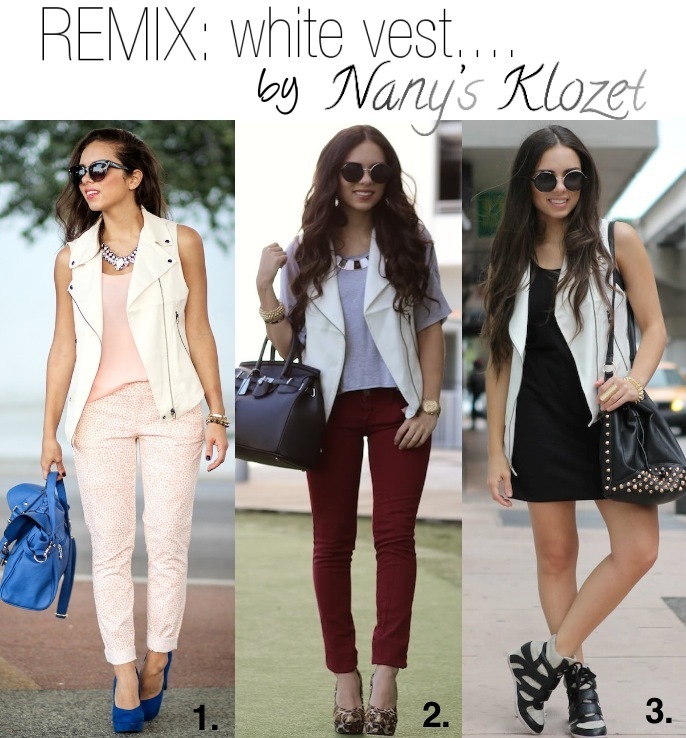 Love the three different looks with the white vest darling, my favourite being 2! Los tres looks son hermosas ... Me encantó! Great Vest! Love how versatile it can be. Love the vest! I'd have to say look #1 is my favorite - so sweet and springy! i'm totally digging the white leather vest! i need one too!! Definitely craving for the second outfit! This white vest looks really nice !